Chistophe Morisset, conception, composer, serpent ; Anne Bernard, viola da gamba ; Isabelle Gruand, costumes, objects. In A Curious Concert, the duo Lucanes (Anne Bernard - viola da gamba and Christophe Morisset - snake) offers us a moment of music from outside the current time, a poetic bubble evoking the relationship of men and insects and the relationship to nature and the feelings inspired by it. 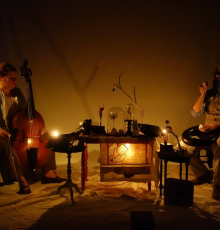 This singular concert takes place in a scenography evoking an intimate cabinet of curiosities, a humble collection of small wonders, sound objects and memories. Above all, there are two ancient instruments taken out of their historical context, which flourish through dialogue in a repertoire composed of original music and some transcriptions by François Couperin. In a living tableau, the decor comes to life discreetly with delicate light changes. It invites the listener to dreamland, to a sweet melancholy carried by the rich and rare sound palette of this unique duet.